Synopsis: In the future, a wealthy family is held hostage for harboring the target of a murderous syndicate during the Purge, a 12-hour period in which any and all crime is legalized. 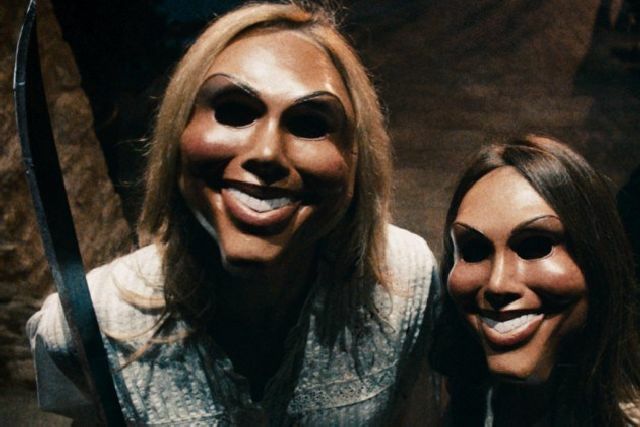 I honestly can’t remember ever seeing a more annoying movie than The Purge. It has, at its core, a reasonably original idea, but it’s one that’s put across in such an ill-conceived manner by writer-director James DeMonaco that we’re never convinced by the alternative reality he has created, or of the viability of such a complex social concept as the 12-hour-long annual legalising of all crime around which it is based. Whether DeMonaco genuinely had an urge to make some kind of political statement is open to question, particularly as he puts his message across in such an obvious, yet curiously ham-fisted, way. Strip away that social context and you have a bulk-standard home-invasion movie, reinstate it and you reduce that home-invasion movie to a preachy cautionary tale that dares to lecture at the same time as it treats us to scenes of people being shot and stabbed. The film opens with a title that reads ‘Blessed be the new founding fathers for letting us purge and cleanse our souls. Blessed be America, a nation reborn.’ Now, for a filmmaker with a message, such an inflammatory statement would provide enough fuel for half a dozen movies, but DeMonaco exposes where his real priorities lie by failing almost completely to provide his audience with any sociological background to explain or to elaborate upon that statement in anything other the most cursory manner. We learn that crime is almost non-existent 364-and-a-½ days of the year thanks to The Purge, and that the economy is booming after emerging from a quadruple-dip depression, but DeMonaco provides no explanation as to why the existence of Purge Night should result in an unprecedented economic recovery. He doesn’t even tell us who the Founding Fathers are or why an entire nation would embrace an invitation to wholesale slaughter so readily. All this is unimportant to family man James Sandin (Ethan Hawke). He’s a top home security salesman grown fat upon the necessity for his equally wealthy neighbours to purchase elaborate security systems such as the one he sells — and which he also has installed in his palatial home — in order to keep them safe for just twelve hours each year. It’s perhaps inevitable that he and his family are the object of a certain level of resentment from an otherwise friendly neighbour (Arija Bareikis). One thing’s for sure — that’s one lady from whom I wouldn’t be accepting any cookies on Purge Night. On the night of the purge, there’s a certain amount of smugness about James as he settles down for the night in his fortified home with his wife Mary (Lena Headey — Dredd, The Parole Officer), daughter Zoe (Adelaide Kane) and son Charlie (Max Burkholder), even though home life isn’t quite as idyllic as he likes to pretend. Zoe is secretly dating Henry (Tony Oller), an older boy whom James has forbidden her from seeing, and Charlie has a habit of recording his heart rate every hour, and has built a mobile robot with which he spies upon the other members of his family. Presumably James hasn’t watched many movies, otherwise he wouldn’t be feeling so smug. All armour has a chink, and James’s is that weird son of his who, when he sees a wounded black man (Edwin Hodge — The Alamo) roaming the street outside their house begging someone to help him, takes it upon himself to disarm the home security system and invite the stranger inside. Considering that everything that subsequently happens is a consequence of his stupidity, it’s surprising that DeMonaco doesn’t at least show him experiencing a little remorse, but Charlie later compounds his recklessness when, after the group of yuppie-freaks hunting the black guy have instructed James to send their prey out or pay with his family’s life, he guides the interloper to a hidey-hole known only to him and his sister. So you know how that’s going to work out. Having been presented with this ultimatum thanks to the actions of his moronic son, James has to negotiate the darkened rooms and hallways of his home (the freaks cut the power) in search of the black guy who got away when Henry (remember Henry? He’s the one diddling James’s daughter) shot at James under the pretence of wanting to have a heart-to-heart about the Zoe situation. Exactly how he thought killing her Dad was going to deepen their love for one another is another mystery created by the art of poor story-writing skills and zero depth of character. Anyway, James isn’t feeling so smug now, is he? Stumbling around those corridors with a gun in one hand and a torch in the other, trying to find a guy who doesn’t want to be found before the Purgers outside tear out his security system with I-want-my-money-back ease? Honestly, this movie really is exasperating — not only because of the contrived nature of its far-fetched plot and the stupid behaviour of most of its characters, but because it keeps trying to make this big statement about the vulnerability to, and propensity of, the poor towards violent crime, and the way in which the wealthy cocoon themselves from the plight of the poor behind expensive security systems. DeMonaco warns us that this protection we’ve built for ourselves isn’t as robust as we might like to believe, while then suggesting that the wealthy share the same violent tendencies as the rest of us, and therefore have no right to look down upon those less privileged. And of course he’s right, I just can’t decide whether the manner in which he keeps hammering his message home is down to an unsophisticated form of storytelling on his part or a conscious — and somewhat contentious — decision to put his message across in a way that even those who just want to see people getting skewered by a 12” knife will grasp. The Purge does have some tense passages, and Hawke is convincingly effective as an ordinary man struggling to overcome his fears as he tries to defend his family from an unreasoning force of violence. Unfortunately, any good stuff to be found in The Purge is built upon a weak foundation that crumbles like dry sand under anything approaching close scrutiny.